cajun seasoning and leftover whole lemon (after saving the juice and lemon zest for cocktail). 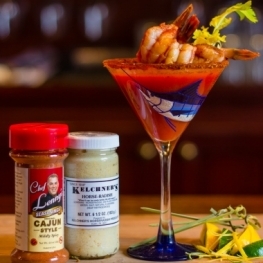 with cajun seasoning, pour liquid mixture, and garnish with two shrimp. Serve chilled and enjoy! *Courtesy of Chef Lenny, Soul Mate Spices, LLC.